The ACA utilizes the idea of non-physician professionals to help bridge the gap presented by having insufficient physicians to handle patients. It is hoped that utilizing these professionals will help increase communications with patients, particularly chronic patients who could avoid hospital stays by seeing a nurse practitioner for an office visit or even email communication with a knowledgeable professional Finally, utilizing non-physicians should lower costs. In California, this presents some major issues. California carefully regulates the use of such professionals, particularly nurse practitioners. Specialists need to pay attention to creating the right environment for such professionals. Standardized Procedures should be updated to conform to the needs of the practice. The California Code of Regulations (Title 16, section 1472) requires physicians to have “standardized procedures” before permitting registered nurses to perform treatments and procedures. The purpose of the standardized procedures is to establish policies and protocols for NPs so that they are able to perform their authorized duties. It is particularly important to update these standardized procedures because your NP will most likely be characterized as your employee, which will expand the scope of your liability for her acts. v Specify which functions the nurse may perform and under what circumstances. v State specific requirements to be followed by the nurse in performing specific functions. v Specify experience, training, and education requirements for the performance of the procedure function. v Establish a method for initial and continuing evaluation of the competence of the registered nurse. v Provide for a method of maintaining a written record of who is authorized to perform standardized procedure functions. v Specify the scope of supervision required for performance of standardized procedure functions. v Set forth specialized circumstances under which the nurse is to immediately communicate with the patient’s physician concerning the patient’s condition. v State the limitations on settings. v Specify patient record keeping requirements. v Provide for a method of periodic review of the standardized procedure. Of particular importance are the standardized procedures on Furnishing Scheduled Drugs. California law requires that you specifically list “which drugs or devices may be furnished or ordered” and “under what circumstances.” (Bus. & Prof. Code, § 2836.1(c)(1).) We recommend to physicians that they review the “List of Scheduled Drugs” to ensure that it is consistent with the drugs that the NP may prescribe to patients. v Which nurse may dispense the hormonal contraceptive. v Minimum training requirements regarding educating patients on medical standards for ongoing women’s preventative health. v Competency in providing the appropriate prior examination of checking blood pressure, weight, and patient and family health history, including medications taken by the patient. v List of the contraceptives that may be dispensed or administered under specific circumstances. v Criteria and procedure for identification, documentation, and referral of patients with contraindications for hormonal contraceptives and patients in need of a follow-up visit to a physician and surgeon, nurse practitioner, certified nurse-midwife, or physician assistant. v The extent of physician and surgeon supervision requested. NPs must be “clinically-competent” to treat a particular population. Standardized procedures should establish a method for the continuing evaluation of the competence of your NP to perform the specified procedures. Following these procedures will help you utilize nurse practitioners to help your patients. You will also avoid accusations of failing to follow state law in guiding the NPs to perform as if they were an extension of your care. ALL THE AGENCIES THAT REGULATE HEALTHCARE ALL IN ONE PLACE! 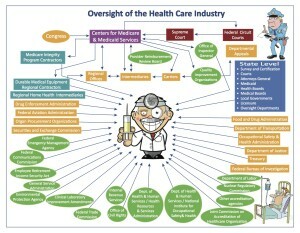 Posted on February 5, 2014 by Matt Kinley | Comments Off on ALL THE AGENCIES THAT REGULATE HEALTHCARE ALL IN ONE PLACE! Comments Off on ALL THE AGENCIES THAT REGULATE HEALTHCARE ALL IN ONE PLACE! avoiding fraud and theft in healthcare professionals’ offices. of prescribing pain killers for their patients. medicate every American around the clock for a month. making it on the black market. potential detrimental effects of potential addiction. and monitor for substance abuse and mental health problems. vigilant for scams and identity theft. pain killers only after examining the patient. an appropriate prior examination and a medical indication. have not been effective for pain. for prescription forms for controlled substances. By Matthew L. Kinley, Esq. The Office of Civil Rights will begin enforcement of the Omnibus Rule September 23, 2013. Attend this session to learn what actions your practice must take to meet the new federal compliance regulations. RSVP to Maria Taylor at 714-937-2182 or mtaylor@osiortho.com. Vendors who attend the first time – $50. Other Non-Member vendors – $95.